Home > Travel > Vacation > Can Americans Travel to Cuba? Can Americans Travel to Cuba? So they lifted the Cuba embargo in early 2015 and now you want to jump on the next plane to Havana! Not so fast there Speedy Gonzales. If you’re an American, you might want to read this before you start packing your bags and heading south. In case you haven’t heard, things between the United States and Cuba haven’t been so hot for a while. This little island less than 100 miles off the coast of Florida has been off-limits for American tourists for nearly half a century, making it that much more intriguing. With pristine beaches and a romantic culture, it’s no stranger to visitors though; other Western countries are not banned from spending their time and money there. Historically, Canadians and Europeans have been among the top visitors to Cuba. In January 2011, President Obama and his administration took a series of steps reducing the number of restrictions between the United States and Cuba in part to help support the Cuban people and support their desire to live in a democracy. One of the changes to the regulations allowed for Americans to travel to Cuba for purposeful (or “people to people”) travel that would help educate and inspire both the life of the traveling American and the lives of those living in Cuba. While it was a step in the right direction, it was still difficult to obtain a visa, let alone arrange for transportation to and from the country. Loosening the laws seems to have worked because according to the World Affairs Council of Philadelphia, nearly 700,000 U.S. citizens traveled to Cuba in 2014, up from 500,000 in 2013 (reported by USA Today). And that number is only going to increase with the sweeping changes that the White House released in January 2015 making trade and travel even less difficult in efforts to normalize foreign relations with the neighboring country. Can U.S. Citizens travel to Cuba? Yes, and no. To legally get into the country you’ll need a visa. And to get a visa, you’ll need to meet one of 12 categories currently allowed under U.S. jurisdiction. That’s not too difficult to do, especially since tour companies are now marketing travel packages that include activities that meet the qualifications for you. So, if you do happen to fit into one of these criteria, then congrats! It will cost you around $25-30 USD to obtain your visa for travel. In addition, Cuba requires non-U.S. medical insurance. (Which is probably a good thing to have, and it’s fairly cheap and simple to get). If you book a tour or are flying directly from the United States, a policy should be included in the price of your ticket. But if not, there are usually agents who can sell you a temporary policy upon arrival at the Havana airport for a nominal fee (approximately $3 USD per day). 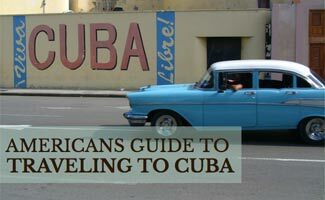 Traveling to Cuba From the U.S.
Making the trek down? Keep in mind, it’s not like most Caribbean destinations, or like anywhere else in the world for that matter. It’s dictatorship government coupled with the several decades long U.S embargo has resulted in a lack of infrastructure. It’s a little like going back in time to 1950. Most amenities that we are accustomed to can be hard to come by. Although tourism is on the rise, most frequently visited destinations within Cuba have not caught up to the times yet. So be prepared! Finding a place to take credit cards is rare and ATMs are nearly obsolete, so cash is king. Euros and Pesos are accepted most places, but the US dollar is not only unaccepted, it could cost you a fine. The safest bet is to convert your money to the national currency (CUC) before you go. Also, don’t expect to be posting your adventures to Instagram or calling to arrange for dinner reservations. WiFi is pretty much non-existent and U.S. cell phones will not work, even in roaming mode. So leave your smartphone at home (unless you plan to use it simply to take photos). Once you get to the island (and find a place to stay) there is no shortage of sites to see and attractions to take in – everything from visiting Ernest Hemingway’s House and cigar factories to enjoying Cuban coffee, rum and music. Looking for good food? It’s common for foreigners and locals alike to eat at paladares (aka people’s homes) since many restaurants are still government-run and/or run out of food. It’s only a hop, skip and a jump away but Cuba feels like another world. Watch this video about what to expect in Cuba along with some stunning visuals of Havana. Convinced and considering going to Cuba? Have you been? Was it difficult to get in? Great write up on Cuba Sadie! I’ve been wanting to go to Cuba for years and it looks like now may finally be my chance 🙂 Being a cigar aficionado, I’m also interested in bringing some fine Cuban stogies home (Monte Cristo is my favorite). Do you have any guidance as to whether or not that’s allowed, and if so, what the allowance is? Also, I’ve heard cruises are an easy way to travel to Cuba since they handle the visas for you. But does that affect the cigar allowance? Thanks for entertaining my many questions, I love your website! Hey Sam, if you are considering you should definitely take this opportunity to go! To answer your first question, Americans are allowed to bring up to $400 back in souvenirs but only $100 can be alcohol or tobacco use (unfortunately for you). However Cuba is a great place to tour cigar factories and get to know the heritage behind some of your favorites like the Monte Cristo! As far as cruises, yes that is an easy and entertaining way to way to get there however the regulations for imports are the same as other methods of travel. Glad to hear you like our website! Thanks for reading and if you end up going, please come back and let us know about your experience! Thanks for the quick reply Sadie! Cruise it is then since apparently that makes the Visa hassle much easier (and I’ll still get my stogies 🙂 Great call on visiting the cigar factories, I definitely plan on doing that.